I don’t know how you like your potato salads, but this is how we have ours. You should try it. I do this the lazy way because I can’t be bothered to peel hot potatoes or wait till they’re cool – so instead, I peel and slice them thinly before boiling them. So smart and efficient, I know. So once they’re all sliced, they go into a big pot with some water. Bring to the boil and add a bit of salt, about as much as you’d add to a pot of pasta – it’s got to taste salty. Let the potato slices boil until just soft – check every few minutes by nipping some off with a spoon and tasting it: firm but cooked is what we’re going for. When they’re ready a few will have decided to break apart already, which is fine. Drain them and put them in a big bowl. Add the veggie stock and let it sit until cooled down a bit. Hot potatoes tend to be thirsty, so we want to minimise the possibility of them soaking up too much dressing. You can give it a stir here and there, but don’t go too crazy because otherwise you’ll end up with mash. In the meantime, mix the mayo, oil, balsamic, stock powder, maple syrup, onion and chives in a separate bowl. Pour over the potatoes, add the cornichons and gently stir. The dressing will become quite liquid because of the residual heat of the potatoes, but do not fear! It will all thicken again once it’s reached room temperature. Cover it and transfer to the fridge for at least half an hour. Give it a quick taste – you might need to add some more salt – then throw some parsley on top and dig in. It’s summer guys! Confusing Swiss summer. I’m surprisingly okay with that. No sweating! No sunburn! And lots of happy green trees having a ball of a time. Gentle monsoons is where we’re at. In order to celebrate the very agreeable climate had here, I thought I’d serve you up a nice little tipple. This is what I’ve been nipping at in the past few months, at first because I was in the mood for something a little less heavy, and then later because there was an inordinate need for something refreshing and citrusy to reflect the parasol- and gumboot clad world outside. Adapted from this recipe . Serves 1. Fill a tumbler with ice. Drizzle over the syrup and juice. Add the bitters, vermouth and gin. Rub the lime rind around the rim of the glass, give it a bit of a squeeze and drop it in. Give everything a good stir and top it with as much sparkling water as you’d like. Using a vegetable peeler, remove as much of the orange and lemon peel as you can. Transfer to a small saucepan. Juice the orange and the lemon, adding that to the peel. Add the rest of the ingredients and bring to a boil. Let it simmer for about 10 minutes (maybe more), until slightly thickened. Remove from the heat and let it cool. When it’s reached room temperature, remove the peel and pour into a large jar. Keeps for a few weeks in the fridge. So today I’m going to tell you the tale of this snazzy piece of ultimate comfort. It started off as the famed khachapuri, a wonderful Georgian cheese stuffed bread, ideal for accompanying anything and everything, especially soup. However, on the visual front it isn’t too much of a looker, so that’s where our trusty pide comes in. Between the two of them, pide wins all the beauty pageants because of its “I’m so much more en vogue than pizza” –presentation. The pide needed something else though, it needed something to cut through its wonderful if not sometimes slightly overwhelming cheesiness, something with a bit of bite, some garlicky, vegetably umph. Hold your kittens, make way for the kale! Here it comes, move out of the way, hail oh mighty kale! Of course I was going to put kale on my cheese pide. I haven’t written about kale for months. One crazy deficit over here. No but for real now, this is wonderful. I absolutely love these as breakfast, but they go well with anything feast- or soup related. I personally go for a drizzle of sweet chilli with mine, but see what flavour combo works best for your tastebuds. If you’re just after the cheese-less, round, covered version of this, i.e. khachapuri, Follow the recipe below, but instead of shaping boats, roll out two big round disks of dough, covering one with the cheese mixture, then pinch together the edges. The cooking time should be more or less the same, but keep an eye on it. As soon as it’s golden brown on top it’s done. For the dough, whisk together the yoghurt, butter and egg with a fork. In a large bowl, add 250g of your flour – keep the rest close at hand, because you’ll need it as you keep going. Stir in your yoghurt mixture. Stir stir stir, using a knife or spoon first, until it starts to combine and you can use your hands. Add more flour gradually until you have a soft but not sticky dough. Add the salt and the baking soda and knead that into the dough. I’m not quite sure why this happens at the end, but Nigella says to do so and we don’t question her. Next, cover the dough with clingwrap and let it rest for about 20 – 30 minutes. Next, get a large frying pan and add the olive oil and kale. At this point I like to add a splash of water and cover it with a lid, and let it cook on medium heat until softened. Remove the lid and turn up the heat, adding the garlic. Once the kale’s volume has reduced to about 1/5 of what it was when it was freshly chopped, add the soy sauce and let that bubble away before removing it from the heat. For the cheese filling, grate the mozzarella and combine it with the feta and the cream cheese. Stir in the egg. It’s not completely necessary to add the egg, however I find it helps keep the filling together. Preheat the oven to 220°C. Divide the dough into 4 or 6 pieces. Roll one of those pieces into an oval shape of about 5mm thickness. Spread some of the cheese mixture along the centre and add some of the kale. Fold in the edges and pinch together the ends. Repeat with the rest of the ingredients. Slide the pide onto a baking paper lined baking tray and bake for about 20 minutes, or until the edges are golden and the bottom is cooked when lifted up to test. Serve with sweet chilli sauce, a knife and a napkin. Let’s talk about salad. Nah just kidding, let’s talk about salad dressing. I do love me a good salad here and there, with crumbled bits of toasted stuff and juicy bursts of caramelised and vine-ripened vegetable shards literally jumping onto the fork with vitamin-spurred enthusiasm. Those salads are fantastic. But really, a salad is nothing without it’s dressing. Sometimes, when I’m less in the mood for a frilly salad, I’ll go for something simpler, dressed in a creamy outfit, something that’ll accompany my meal of carb on carb and turn it into something that resembles a balanced food pyramid if you squint. For once no chia seed and watermelon oil dressing kittens, but a dressing your grandma would make if she were Swiss, lived on top of a mountain and yodelled her chickens awake in the wee hours of the morning. It’s a dressing that would make most picky grandchildren lick their plates clean. Whisk the ingredients together, adding the liquids slowly to the mayo so it becomes smooth. Done! This will keep in the fridge for three or so days, but depending on the amount of salad you’re making, you might need all of it. One of the most frequently eaten salads here in Switzerland would be the “Nüsslersalat”, or lambs lettuce. It has a delicate, tear-shaped leaf and is known for its nutty flavour. If you can’t find it, replace with anything else that’s green that you’re in the mood for. All we do is finely dice a few hard-boiled eggs and toss them with the lettuce and the dressing. Serve immediately, because the greens don’t like to stand around for too long. If you’re wanting to jazz up your carrot salad, thinly slice a head of fennel with half a kilo of carrots, throw some of the springy green fronds in, a few chopped parsley leaves if you have some, and mix with the dressing. …And merry December to you too. My expectations of a cold winter have been fulfilled (woo! ), it has snowed once and rained a few more other times. Switzerland, it’s good to be back. It’s biscuit season over here, and enthusiastic about European tradition as I am, I’m surprised it’s taken me this long to tell you guys about my first batch of goodies. They’re quite wonderful, if I say so myself. They’re nothing typically traditional, but still familiar enough and a bunch of fun to shape. The trick to getting moist, sticky-centred, yet toasty crunchy crusted macaroons is to give them a pre-treatment in a large frypan, giving them plenty of rest time before finishing them off in the oven. In a large frypan, mix together the egg whites, sugar, salt, honey, coconut and flour. Over low heat, stir the mixture constantly, making sure you scrape the bottom to prevent it from scorching. When the mixture becomes hot, stir it for 2-3 more minutes, then remove it from the heat and add the vanilla essence. Transfer it to a bowl and cool it to room temperature – it will be a lot easier to handle then. If you’re not in a hurry, or completely forgot you had something important on, you can cover the macaroon dough and keep it in the fridge for up to a week. However, if you are ready, preheat your oven to 180°C and line a baking tray with baking paper. Form 1 Tbsp mounds of the mixture into triangular pyramids. To help get each side nice and flat, flatten it gently on an even surface. If your hands get to sticky, give them a rinse under some cold water Space them evenly on the baking sheet. Bake for 16-18 minutes, until deep golden brown. Cool completely. Almost four weeks ago, I got on a plane with two very heavy suitcases, two packets of tissues and a heart full of excitement. After six absolutely wonderful years in Australia, I returned to Switzerland, my other home. It’s great to be back. This time round it’s a little easier getting used to my “new” home, because everything is familiar. Yet there are so many subtle differences I’m having to accustom myself to, such as not adding a “how are you?” after the initial “hello” when speaking to a stranger, having to look up when waiting for a green light when crossing the street because it doesn’t make a clicking noise when it’s okay to go and remembering that most of the shops are definitely not open on Sundays. And at the same time I can’t help but miss the smell of eucalyptus, the friendly cats everywhere, the affordable restaurant food, the lovely friends left behind. Sigh. Before I get all mopey and nostalgic, let me share with you a recipe I used to make about once a week back in the Melbourne era. It’s not really a recipe per se, more an assembly of ingredients, one I’d fall back onto when my five a day count was near non-existent, when I felt that I needed to give myself and my suffering immune system some pampering. It’s a simple vegetable soup, with the addition of saffron, for a little special hint of sunny warmth. You can add pulses, pasta and any herb you like, but I usually like to keep it simple and stick to the veggies in my fridge. The actual star of this dish is the chipotle butter, which I used to have on toast, now on fresh, crunchy, chewy bread (gasp!). It’s spicy and wonderful and very very morish, so be sure to make more than you think you’ll need. To cold days, to winter, to warm hugs and memories. In a large saucepan, fry the onion in the oil until translucent. Add the garlic, stir for a minute or two, then add the tomatoes. Once the tomatoes are soft, add the rest of the vegetables, the stock and the saffron. Bring to the boil and simmer gently until all vegetables are cooked through. Brighten the soup with the lemon (you don’t need much) juice, add the soy sauce for a boost of umami, and season to taste. Serve with crusty bread or toast and chipotle butter (below). In a bowl, beat the butter with a fork to loosen it up. Add one teaspoon of chipotle and a few pinches of salt, as well as the lemon. Give it a good stir. Have a taste, then add more or the rest of the chipotle. It will seem quite spicy at first, however it will soften as it rests. If you really don’t like spicy, I suggest you only use ¼ tsp of chipotle and replace the rest with smoked paprika powder. For years I had decided that martinis weren’t my thing. Too strong. what’s the point, give me one of those sweet ones instead. And to some extent, I still agree with that line of thought. But now I also know that there is a martini for everyone, or at least almost everyone, minus the uncool people. This came to be while I was having dinner at this Italian place with two dear friends of mine, and for some reason I was feeling a bit frisky and up for a bit of a challenge in the drink sector. I confided in the lovely waitress that I was new to this, and I don’t know what was said between her and the barman, or what he was plotting in that little genius mind of his, but what came to the table a few minutes later made me re-evaluate my life’s decisions and ponder over what else was lying ahead of me, yet to be uncovered or rediscovered. The martini was ever so slightly sweet, balanced out by the salt from the olive brine, and the gin, oh how it sung. None of that punch-in-your-face bull of “I’m a purist martini, triple concentrated and only held within the vicinity of a photograph of a water droplet, because dilution would be a sin. Vermouth was never in fashion anyway.” No, this was sophistication in a glass. Weeks later, after repeated experimentation with vermouth and olives of different degrees colour and texture, we got there. And I’ve been making them ever since. You’ve heard of a perfect martini, right? That’s equal parts sweet to dry vermouth. I don’t care what you think, but I like the sweet edge the former gives to the drink. The way to prevent it from becoming too girly or overpowering, is by giving it a nice dose of dirty with that olive brine. Essentially it’s combining a perfect and the dirty. In with the gin, stir, stir, stir, pour, garnish, yum. 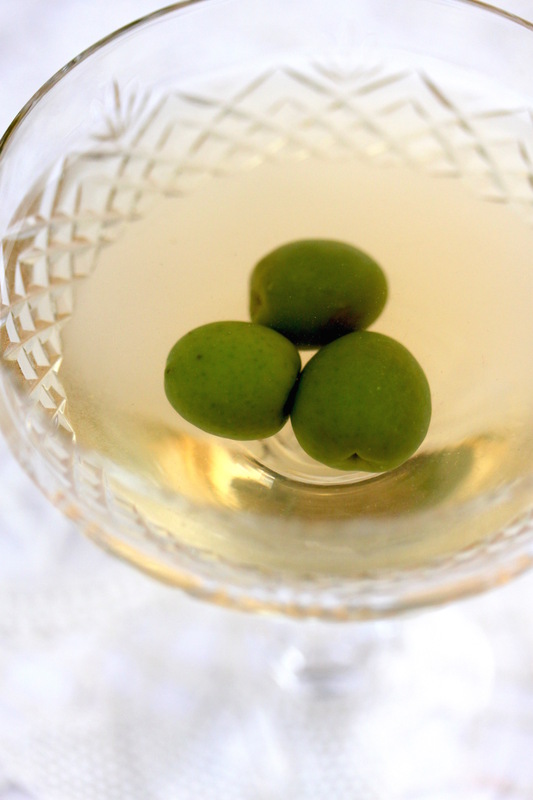 If you’ve never been a martini person either, give this a try. It might just change your mind. And if you already have a favourite recipe, and you will have it no other way, then I hope that at least you can appreciate the photographs I made of mine. 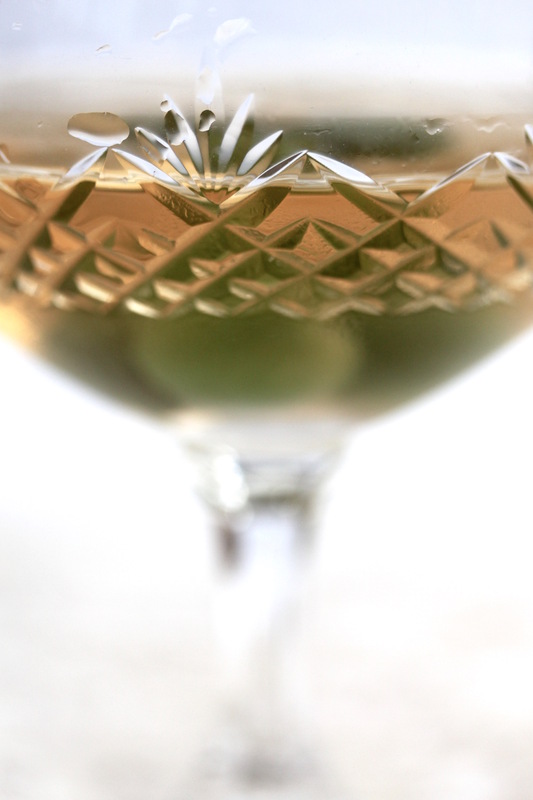 Combine both vermouths with the olive brine, gin and ice in a jar or tall glass. Stir intensely for a minute or so until very very cold – you want a bit of dilution going on if you’re like me and don’t like being assaulted in the neck by what tastes like a shot of scented nail polish remover. If you’re unsure, give it a little taste. Give it a few more stirs if you’re not satisfied yet, or strain it into a coupe glass. Add your olives and enjoy. ‘Tis the season my friends. Time for mulled everything. Everyone is trying to top everyone else in winging about how cold it is, but secretly they love it, because who doesn’t love a steaming mug of something spiked warming up their frozen nose hair. Warmed nose hair for everyone! We’ve had hot buttered rum before, which went down a treat – but now it’s time for the antioxidant-rich grape to take centre stage and charm our socks off. This recipe calls for the creation of a complexly spiced syrup, to which later you add some red and a few splashes of ginger wine. That way you can either store it in the fridge for a few weeks, use half, or have it all straight away. This method also ensures that most of the alcohol is still present by the time of serving. None of this boiling-wine-for-two-hours business. And honestly? Most bars, no matter how craft and boutique and amazing they are, their mulled wine won’t be as good as this. Promise. This will make about 12 servings. If you aren’t up for cracking open two bottles of red because you’re a smallish group, make the syrup and only use half, combined with half of the rest of the ingredients. The syrup will last for a few weeks in a jar in the fridge. 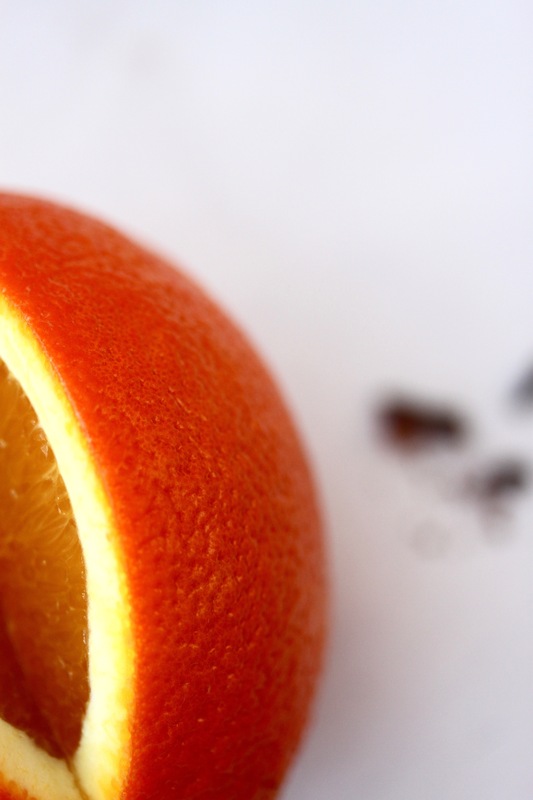 Remove the peel from one orange using a vegetable peeler, then squeeze out the juice. Add both to a big saucepan along with the lemon peel, the sugar and the spices. Add a few small glugs of wine, enough to cover the sugar, and let it simmer over low heat, stirring occasionally, for about 10 minutes. You should be left with a thick syrup. If I have the time I like to let it sit for a bit to let the flavours meld. 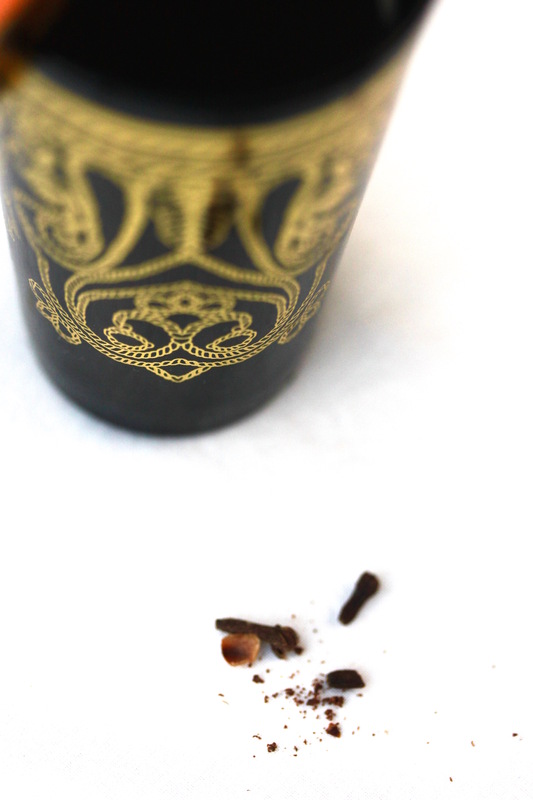 If you’re keen on doing some shmancy decorating, get the remaining orange and the remaining cloves, and make a few (as many guests as you have)vertical clove lines down the side of the orange. 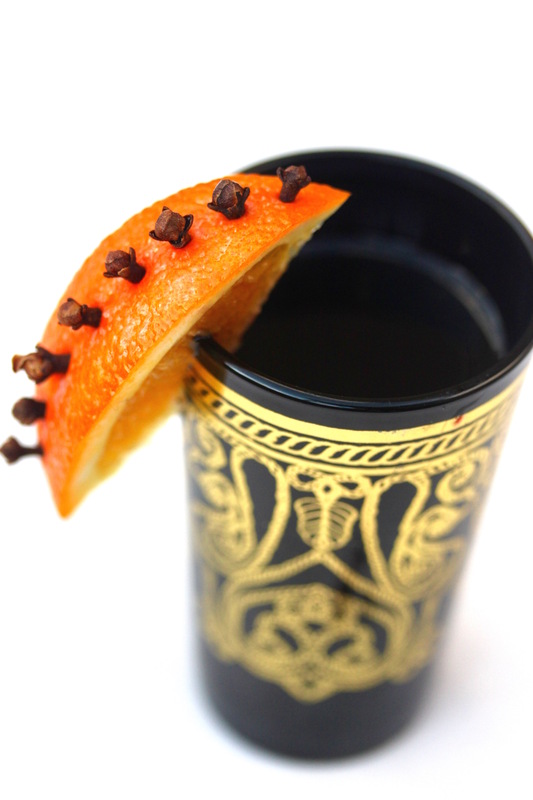 slice it into segments and voilà, your garnish is complete. Once you’re ready to serve, add the rest of the red wine as well as the ginger wine, and gently heat the mixture until hot. Ladle into cups and squeeze an orange segment onto the edge of each. Yum! Autumn is such a beautiful time of year. The mornings surprise you with their icy presence, the tips of the trees are starting to turn golden, and the fruit trees in the neighbours’ gardens are exploding with a bounty of ripe goods. Soup season has well and truly arrived. While the jumpers have begun to reconquer their place in the cupboard, our daily tea consumption has doubled. Root vegetables are waving to us warmly at the supermarket as we gently bundle them up and take them home to create a dish of filling comfort. Growing up in Bern, soup was an ever-popular staple over the colder months. At my dad’s we had a recurring list of menus to which we’d fall back on, including my stepmum’s legendary Bircher Müesli, Gschweuti, which is basically boiled potatoes served with a selection of toppings, apple tart, and at the time my little sister’s favourite, Riz Casimir, rice served with tinned fruit and tofu in a mild curry sauce. Another favourite, but slightly more rare guest on our dinner table, was borscht. I loved the almost ceremonial way the sour cream was dolloped onto the steaming burgundy soup, how you had to give it a good scattering of chopped dill fronds before gently scooping it up with a spoon, all the while trying not to disturb the stunning contrast of the beautiful colours. So there I was the other day, daydreaming about finger food (yet again), when I thought about how swell it would be if I took those earthy cold-weathery borscht components and jazzed them up into a suave little nibble. Bring on that beetroot. These babies are best assembled shortly before entering your mouth, so I suggest you spread all the ingredients out on a table and let everyone construct their little poppadum parcels themselves. A few hours before you want to make this nibble, start with roasting the beetroot. Do this by preheating the oven to 180°C, wrapping the beet tightly in tin foil, and letting it roast for a few hours. It will be done when you can easily slide a knife into it. Remove from the oven and cool. When ready to make the relish, peel and grate the beetroot on the large holed – side of a box grater and set aside. In a small saucepan, heat the mustard seeds until they begin to pop. Add the olive oil and onion, and cook until translucent. Add the rest of the ingredients and let them bubble away until almost all of the liquid has evaporated. Make sure you stir it occasionally so it doesn’t catch. Once it’s done, remove from the heat and transfer to a jar. Let it cool down before you serve it. Why? Because the poppadums soften a lot quicker with heat, and we don’t want that. Any leftover relish will keep in your fridge for at least a week. 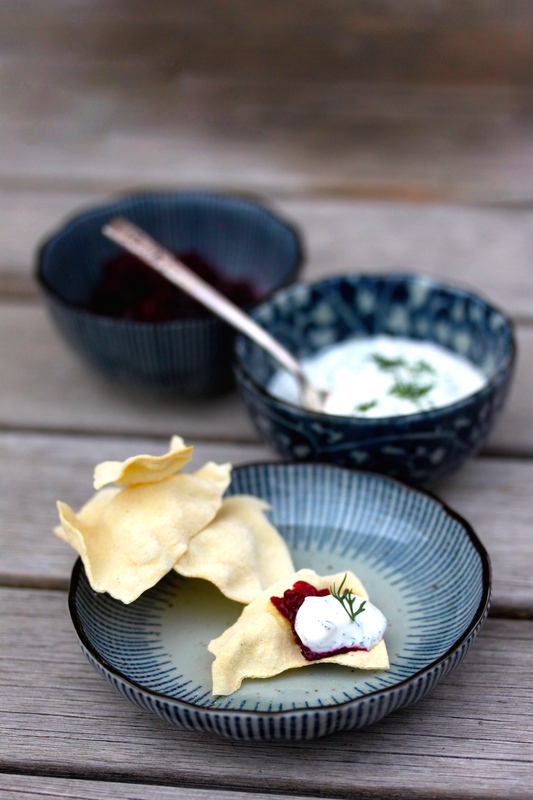 Pop the poppadums in the microwave ( 30 sec – 1 min on high). Stir up the sour cream and mix it with the dill. Get your relish out. Once you’re ready to assemble and immediately eat these cuties, grab a poppadum, top it with some relish and some dill sour cream. Crunch. Repeat. I feel like it’s high time I give you guys something sweet for you to sink your teeth into, but for some reason it’s the savouries that have captured me and taken me on a trip to enthusiasmville, and I must say I quite like it. Up next is a soup I had forgotten about for more than two years, which is bordering on criminal because it truly is a beautiful soup. Harira is one of those exotically seductive yet immensely comforting soups, flashy enough to serve as a special dinner but also perfect for a midweek meal. To make up for the lack of lamb in this vego version, I’ve added a few chopped up dried porcini mushrooms. I’ve also replaced celery, not because I have split feelings about it, but because I think that parsley stalks have an incredibly complex flavour, which cooked along in the soup do a fabulous job at adding that dynamic that usually le celery is responsible for. The medley of spices work spiffingly with the vibrant tomatoey broth, and is made even better by the accompaniment of the sweet buttery almond-flecked couscous. The soup will taste better the next day, as most soups do. But even a few hours after you’ve cooked it will do if that’s all the time you’ve got. And yes I have a thing for shooting food in tiny (blue) dishes. And no, that is not a serving size I would ever dare to serve someone, let alone myself. Place the chopped porcini mushrooms in a small bowl and cover with boiling water. Set aside. In a large pot, heat the olive oil and add the onion and carrot. Fry until softened. Add the garlic and the spices, and stir until fragrant. Add the soaked mushrooms with their liquid, the capsicum, parsley stalks, capsicum, chopped tomatoes and the stock, and bring to the boil. Let it cook until all of the vegetables are soft, about 20 minutes. Add the chickpeas and soy sauce and season to taste with the salt and chilli flakes. When ready to serve, ladle into bowls and top with the parsley and coriander. 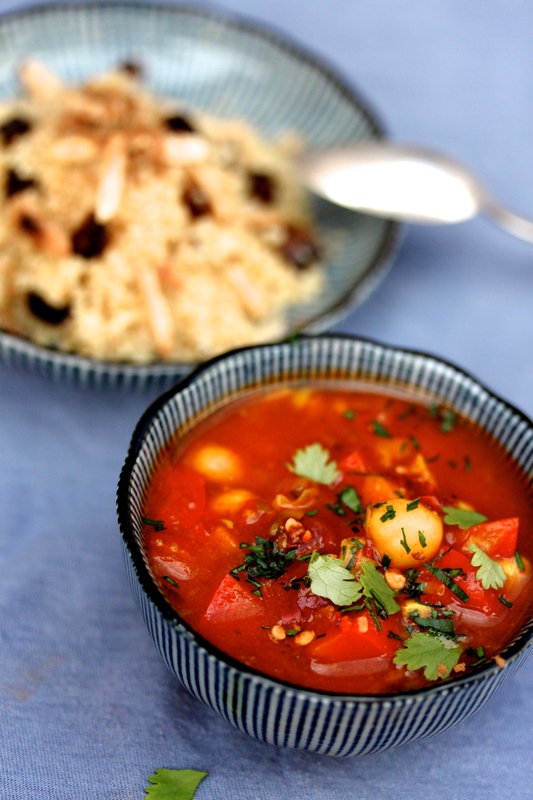 Serve with the couscous (below). In a small pan, melt the butter and add the garlic. Once it starts to go golden, remove from the heat and stir in the couscous and cinnamon. Pour over the boiling veggie stock and cover for about 5 minutes until completely absorbed. Fluff with a fork and stir through the chopped dates. 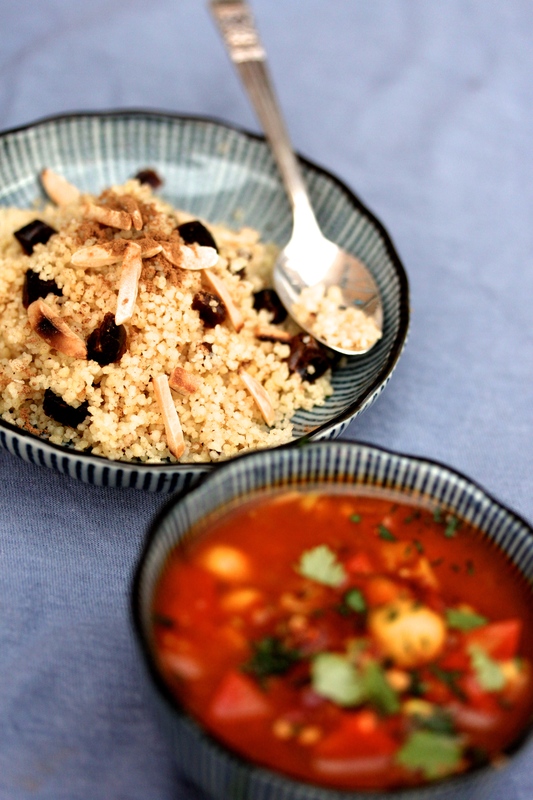 Divide the couscous amongst serving dishes and top with the toasted almonds.